One of the main driving forces behind EBC*L Arab World is to contribute to the economic development of the Arab World. We target to establish a knowledge-based society with the promotion of the fundamental know-how related to the activities of an entrepreneur. In the Arab region, there is a wide scope of the young population who has to recognize that economic added-value and job creation cannot only be expected from political and economic decision-makers. EBC*L Arab World tries to encourage this young generation to stand on its own feet and come up with new, creative economic solutions and business ideas. 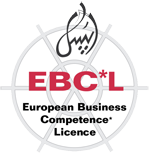 EBC*L Arab World, as an affiliate of EBC*L International covering the Middle Eastern and North African region, delivers core business training through its accredited partners as well as special projects.